How does Box compare to Google Docs, OneDrive, and SharePoint? All three services have similarities, so from a usage standpoint it's somewhat a matter of preference. However, Cornell only provides Google Docs accounts to students; personal Google accounts should not be used for University business. Box is good for storing and sharing large numbers of documents. It provides tools to easily edit common files in Office on the desktop or in Office Online. It can be used to share files with anyone with an email address and to collaborate with other institutions. It provides excellent security for your data with encryption of your data both in transmission and while stored in the cloud, detailed auditing of who has acted on and viewed your files, watermarking of files, and view-only files that you can prevent others from downloading. What kind of files can be shared and previewed with Box? Most common file types are supported. Visit the Box support site to view a complete list of file types supported by Box. For what version of Box has Cornell signed a contract? Cornell has contracted for the Enterprise version. Who is eligible for a Cornell Enterprise Box account? All current faculty, staff, and students at Cornell and Weill Cornell Medical College are eligible for a Cornell Enterprise Box account. Are alumni eligible for a Cornell Enterprise Box account? No. Alumni are ineligible for a Box account in the Cornell Enterprise. Please see What to do before leaving Cornell page for important information. Are retirees eligible for a Cornell Enterprise Box account? Retiree access to Box depends on the retiree's position before they retire. For more information, see the NetID page What Happens When You Leave. If you will lose access to Box when you retire, see the page What to do before leaving Cornell for important information. What apps are available under Cornell's Box agreement? Box currently has developed a number apps that they support and all are available under Cornell’s Box Customer Agreement. See the Cornell Box Official Apps page for the current list of apps. Third Party Apps: There are well over 100 apps that have been developed by other companies, which are neither contractually covered nor supported by Box. Although Cornell is not planning on blocking any specific third party apps, Cornell Enterprise Box account users must be aware that information stored within Box and accessed by a third party app is likely to be pulled out of the secure Box environment when the app is in use. Anyone using a Cornell Enterprise Box account should be aware they are subject to Cornell University Policy 4.12 and 5.10. How many previous versions are kept (and retrievable) for each document stored? Box keeps the most recent 100 versions of each file. These are retained indefinitely (that is, until you upload the 101st version; the oldest is then removed). How long are deleted items kept in the trash? Deleted items remain in the trash for 30 days. During that time, they are recoverable. After 30 days items are purged and are truly gone. How do I get a Cornell Enterprise Box account? Visit cornell.app.box.com, Cornell’s entry point for Box. Click Continue. CUWebLogin will appear. Enter NetID and NetID password. After successful login, the account will be created and it will be possible to immediately access the new account. What's the difference between a personal Box account and a Cornell Enterprise account? See Box Account Types: Cornell Enterprise or Personal for a comparison between personal and enterprise Box accounts. What if I have an existing personal Box account? Change the email address on your personal account to a non-Cornell email address. An enterprise account will then be created for you when you log in with your Cornell email address. Send a request to the IT Service Desk to convert your personal account to an enterprise account. You will have to confirm this transfer once it is initiated. What is the process to sign in to a Cornell Box account? Is a password needed? Signing in to a Cornell Box account is always done using a Cornell NetID and NetID password. I got a blue box login page instead of the red Cornell-branded login page. What do I do? Sometimes when you follow a link to a Box page and you're not already logged in, Box can't tell which enterprise you belong to. To use your Cornell login, click the Sign In with SSO link on the page. The password field will disappear, leaving only the email address field. Enter your Cornell email address and click Authorize. You'll be taken to the Cornell web login page. Can I get a departmental Box account? Yes, you can associate a Box account with an Exchange Group account (EGA). This is highly recommended to separate personal work files from group activities. Think about if you were to move to another job. What files would you want to leave for your co-workers? Those should be stored in a group account folder and not in your personal account. First, you need a suitable EGA. If you don't already have one, follow the instructions on the Resource Accounts page to request one. The EGA will receive some notifications about activities on the folders it owns, so it should not be one where these notifications will interfere with workflow. Forward your request with the name of the EGA to the IT Service Desk. A Box account will be created that is owned by that EGA. The account will have one folder that will be titled with the display name of the EGA. You may rename the folder. The people listed as owners of the EGA will become co-owners of the Box folder. These people can subdivide the folder into subfolders as necessary, and can invite others into the folders. As owners are removed from and added to the EGA, the owner list of the Box folder will also be updated. What are some ways Box can be used? Dell uses Box as a centralized space for design teams to share content and streamline workflow processes. Skype uses Box to send critical training videos and tutorials to customers and remote team members. The Grammy Foundation uses Box to power its annual Entertainment Law Initiative essay contest. Other examples may be found on the vendor's page of customer stories. Are there any restrictions on how a Cornell Enterprise Box account can be used, for example for business or personal use? Box is provided at Cornell for academic and professional use for university business only. 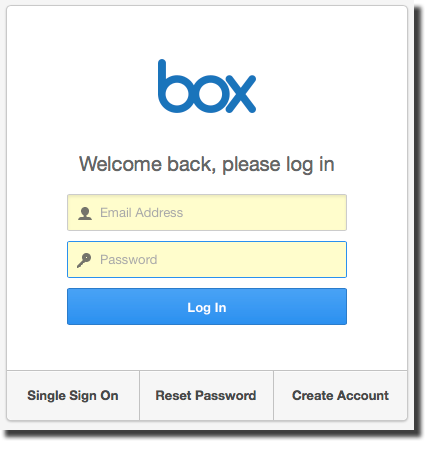 Box provides contextual training as new activities are performed or a new page is accessed. The How to Get Started section in the right column provides information about basic functionality. Box has online training, also available through the Get Training link in the right sidebar of Box. Some of the training is self-paced and some is instructor led. There may be a charge for some modules. The Box Community Forum provides information about more advanced features and functionality. It's also where you can ask questions of other Box users. Cornell has a Using Box group on Yammer where you can share tips and ask questions of other Cornell users. You may easily configure your Box account for use with Google Docs. See Box's Google Docs help page for more information. You can configure Box to notify you when certain items happen. See the vendor's Manage Account Settings article for details. These steps explain how to get started with Cornell's password management service, LastPass. Connect to the eduroam secure wireless network with a Mac. Understand how Cornell's VPN service connects you to the university's networks and services.